The North Coastal Prevention Coalition (NCPC), in partnership with MADD, invite the media to cover STICKER SHOCK as a dozen cooperating businesses discourage providing or purchasing alcohol for underage drinkers around the Labor Day weekend, and throughout the year. Participating businesses will allow youth prevention leaders and adult volunteers to place stickers in English and Spanish on alcohol products stating: “Hey You!! It is ILLEGAL to provide alcohol for people under 21! !” In addition, store personnel will distribute brochures with information about local ‘social host ordinances’ which hold party hosts responsible for ensuring minors do not have access to alcohol at private parties. WHY: Labor Day weekend typically marks the end of summer and kids are back in school. House parties are cited as the most common source of alcohol for teens in surveys collected by NCPC. Underage drinking at house parties can result in severe intoxication, injury, sexual assault, and other dangerous consequences. Everyone can help prevent senseless tragedies by reporting underage drinking parties to local law enforcement. STATS: Alcohol is linked with an estimated 5,000 deaths in people under age 21 each year–more than all illegal drugs combined (www.thecoolspot.gov); this includes motor vehicle crashes, homicides, suicides and unintentional injuries. 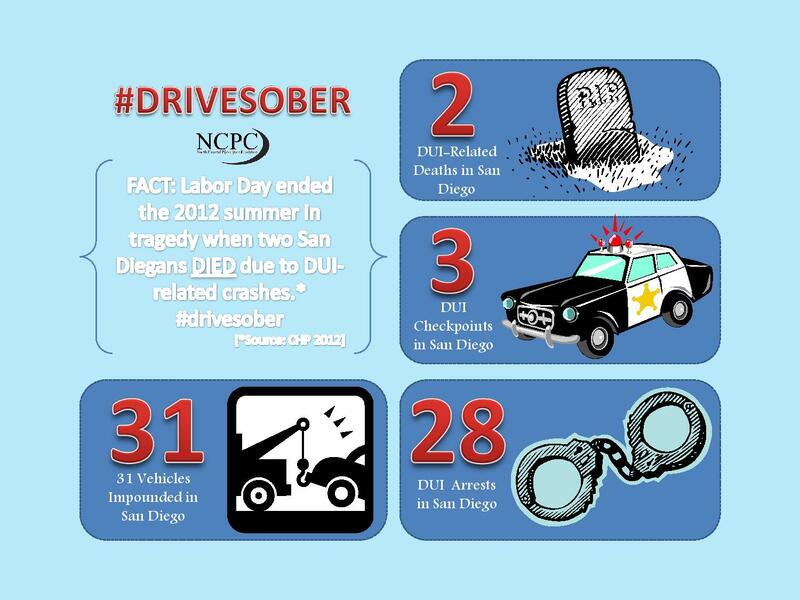 2012 LABOR DAY IN SAN DIEGO COUNTY: In 2012, the California Highway Patrol reported two DUI-related traffic deaths and arrested 69 people in San Diego County on drunk driving charges over Labor Day weekend, according to the California Highway Patrol. Statewide, there were 1,363 DUI arrests and 24 fatal crashes.